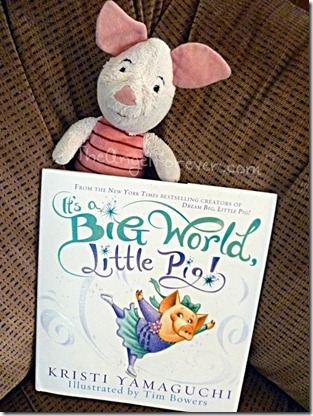 Tuesday Tales – It’s a Big World, Little Pig! When we first got our Kindle, we wanted to try a picture book on it. That is when we met Poppy the Pig in Dream Big, Little Pig! 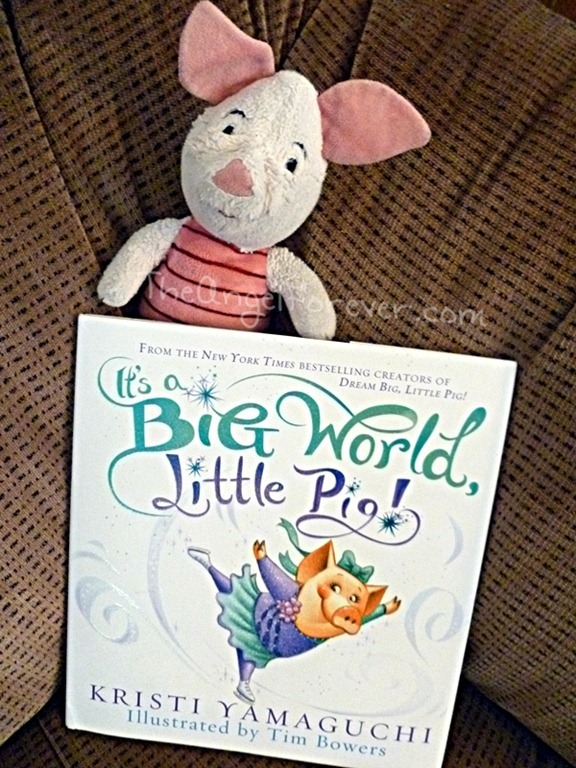 The book was an adorable tale written by figure skating gold medalist Kristi Yamaguchi. In it, Poppy wants to be a star and learns that she has to work hard, be persistent, and believe in herself. When I was contacted by Sourcebooks Jabberwocky to let me know that Poppy was back, we immediately wanted to read about her new adventure. It’s a Big World, Little Pig! is available in stores today. 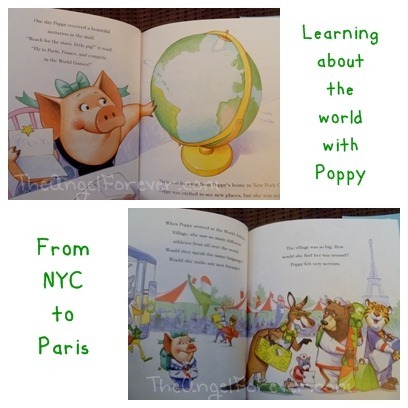 Poppy returns in this book following her dreams of going to a special competition in Paris. The heroine gets nervous about traveling from New York City all the way to Paris. She is especially worried about not making new friends in this far off location. Tim Bowers illustrations whisk us away from Poppy’s home in New York City to the competition village in Paris. 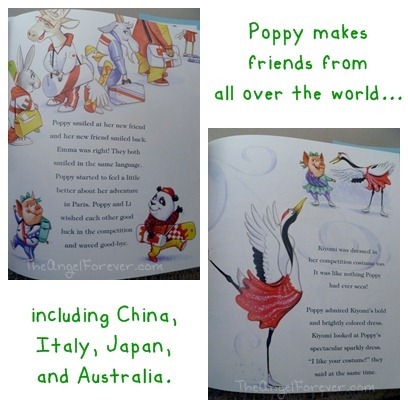 Through the book, Poppy meets and makes friends with competitors from different countries. She waits on line to register and meets a panda from China named Li. They talk, look at a map of the village, and share some of their own language with each other. This learning adventure continues as Poppy meets more friends and they help each other to be less nervous along the way. 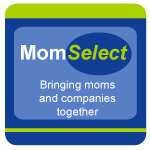 As a parent, I love this book and how Kristi Yamaguchi helps to show that fears are normal when you do something new and different. She also shows that by being brave and meeting new people, you can help each other with these situations. We may not all look the same, or speak the same language, but kindness and smiles are understood by everyone. In addition to this, I adore how supportive Poppy’s parents are and how they continue to encourage her to reach her goals and then travel to view things in Paris with her after the event. The educator in me adores how this book could convert to many teachable moments with older children. Not only can you talk about the concept of following your dreams, but you learn about new cultures, new places, and new languages with Poppy’s new friends. A lot of fun activities with passports. There are even activity kits that you can download for free from the first book that would be fun for children to try. Another great perk about purchasing the book is that Kristi Yamaguchi is donating 100% of her profits from the book to early childhood literacy programs supported by her Always Dream Foundation. Disclosure: I received this book complimentary of Sourcebooks in order to facilitate this review. No other compensation was given. The opinions expressed in the review are my own. 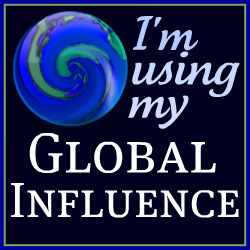 Two Amazon Affiliate links are included in this post for the two books mentioned. I will receive a percentage of money for the sale should you opt to buy the book through that link.